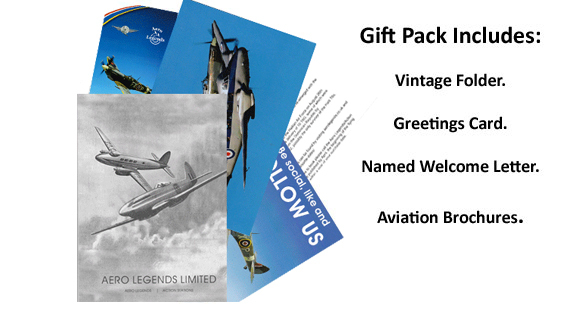 Aero Legends staff greet you both at the Aero Legends main reception and proceed with your check-in. 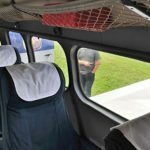 Headcorn Aerodrome both has free parking and good facilities. 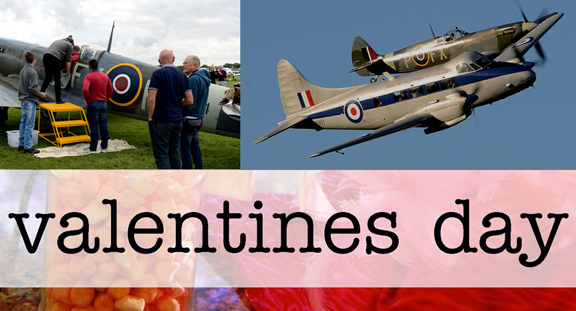 With excellent viewing areas of the runway, a café and licensed bar, we encourage your family and friends to savour the atmosphere and share your day, or just keep it for the two of you. 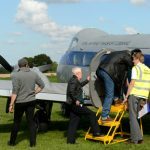 Our flying guest will board an ex-RAF 1946 de Havilland Devon, famously used by Air Chief Marshall Sir Basil Embry as his personal transport during his time as Commander Of Allied Forces, Central Europe. 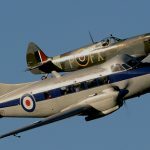 In 1985 the aircraft joined the Battle Of Britain Memorial Flight (BBMF) at RAF Coningsby, where the aircraft was used as a crew transport in support of the BBMF Lancaster, Spitfires and Hurricanes. The Devon and its non-military sister the Dove were exceptionally successful, proving reliable and economical in service. 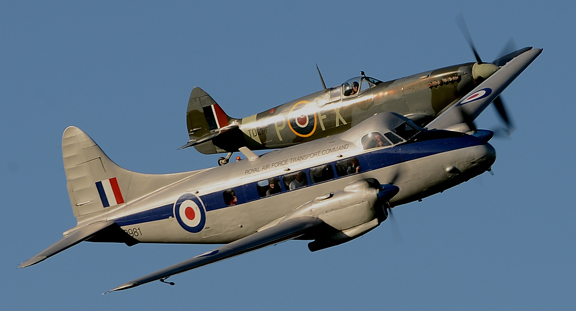 They became one of the best selling British aircraft of the 1950’s. 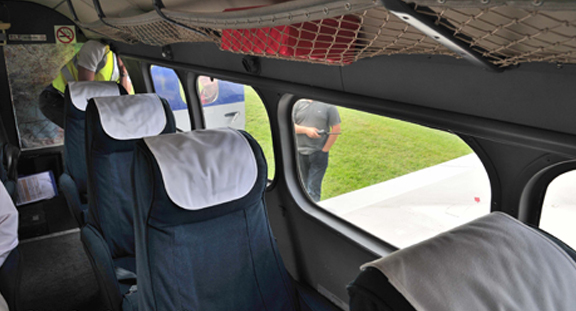 The Devon is a comfortable aircraft inside, with roomy seats and large panoramic windows. There are excellent photo opportunities. Soon after take-off you will be thrilled as the Spitfire draws alongside. The sight of the Spitfire being put through its paces takes your breath away and your heart races as you imagine the emotions of the pilots in ‘the long hot summer of 1940’. Some call it aerial artistry - others flying theatre. 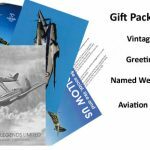 When our Spitfire TD314 St George comes into view, flying within waving distance, it’s as if you are in a dream – the grace and pace of the Spitfire as she manoeuvres around your aircraft sends shivers down the backbone. 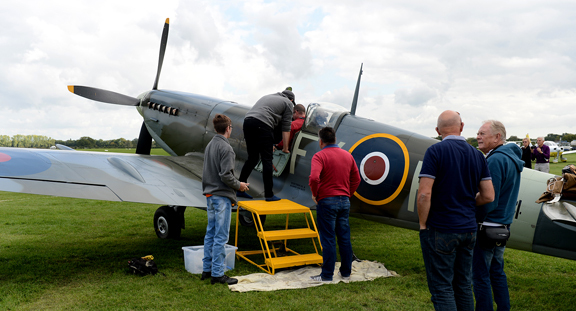 Your experience lasts 20 minutes from engine start to engine stop, with a minimum of 10 minutes alongside the Spitfire. 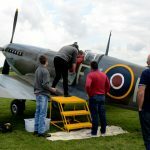 During the event the Spitfire requires refuelling and maintenance checks, and at that time we can showcase her to our flying guests who wish to view the aircraft at close quarters, and take those very special close up photographs. 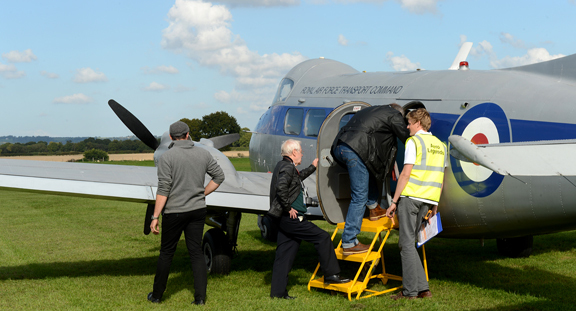 The viewings are hosted by staff members, who will answer all your questions about this iconic aeroplane. 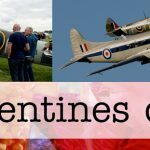 Your Valentines flight includes two Ground Viewings and two Sit In A Spitfire tickets - allowing you both to enjoy time in and around this iconic aircraft and to take some memorable photos of each other.